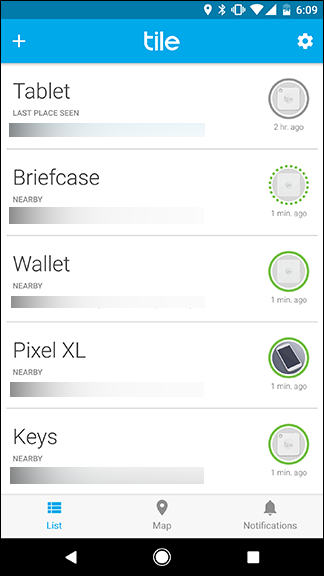 Tile is a handy tracker that you can use to find your keys, wallet, or anything else you might lose often. If you misplace your stuff while you’re away from home, Tile can send you a notification as soon as it locates your stuff. You’ll need to ask for it, though. Here’s how. 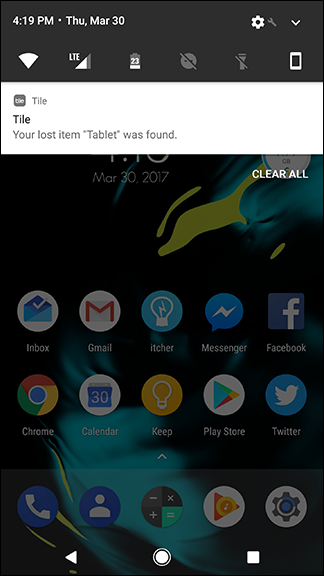 By default, Tile doesn’t send you a notification every time it finds your stuff. Since Tile uses Bluetooth to pair with your phone, you could walk out of range and it would “find” your wallet or keys several times a day. Instead, Tile will only send you a notification when you tell it that you’ve lost your stuff. To enable that notification, open up the Tile app on your phone. You’ll see a list of your items. On the right side, there will be a ring around an icon. If the ring is solid green, your Tile is within range of your phone. If it’s dotted green, you’re in the same location as the Tile, but not close enough to ring it. Try moving to different rooms of your house to find your phone. However, if your Tile is totally gone, you’ll see a solid gray line. That’s when you may want to get notified when it’s found again. That usually means that it’s somewhere other than the place you’re at. For example, if you left your wallet at the bar, but you’re home, that line will turn gray. In that case, tap the Tile in the list that’s gray. 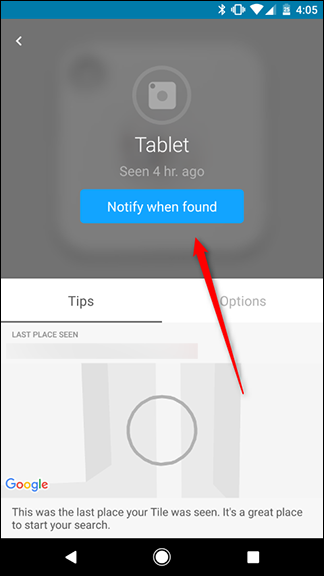 On this screen, you’ll see a blue button that reads “Notify when found.” Tap this button. The next screen will confirm that you’ll receive a push notification and an email the next time your Tile is located. 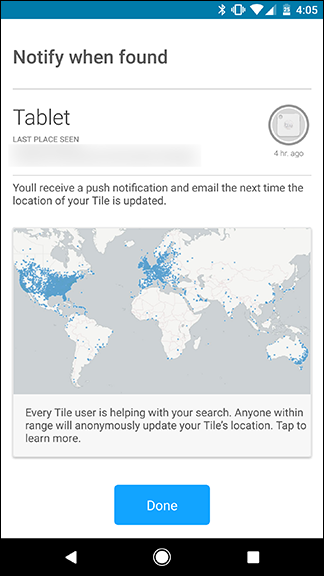 The Tile app uses location information from all of its users to locate missing Tiles, so if yours is lost somewhere and another person who uses the app happens to go near it, you’ll get a notification telling you where it was last seen. It’s not a guarantee, but it helps. Otherwise, Tile will notify your phone the next time you’re within range. When your Tile is located, you’ll get a notification that looks like this. When you see that notification, tap it and you’ll see a map showing you where your Tile was last seen. If you’re in the same place, you can use the Ring button to call your Tile to track it down.